On February 23 the World Business Council for Sustainable Development (WBCSD) launched the Energy Efficiency in Buildings laboratory (EEB Lab) in Shanghai. In a city where 18.4 percent of emissions come from buildings, the EEB Lab is engaging local stakeholders to analyze market barriers and discuss solutions for energy efficiency in buildings. During a three-day launch workshop, experts developed a plan to organize action within Shanghai’s private sector and, in part, help implement the 2016-2020 Shanghai Five-Year Plan for buildings. Unique to China, Five-Year Plans (FYPs) are blueprints that central, state and local governments draft and implement to guide social and economic development. Since 1995, the national government has focused on energy efficiency in buildings in its FYPs, and sub-national governments have followed suit since 2000. Since then, many cities have released Building Energy Efficiency action plans as a sub-component of their FYPs. In fact, incorporating building energy efficiency action plans into FYPs is already a growing trend among many cities across China. Five-Year Plans have served as a significant opportunity for Chinese cities to prioritize energy efficiency, but action plans aren’t limited to China. More cities in China and around the world should adopt action plans, Five-Year or otherwise, to improve energy efficiency in buildings. A common pitfall for cities looking to achieve building efficiency goals is the lack of a clear roadmap. Five-Year Plans in Chinese cities have played a critical role in bridging that gap. Detailed building efficiency action plans within FYPs have laid out policy directions and assigned responsibilities among various government agencies. They have helped break down efficiency targets into multiple tasks so that individual results can be tracked. For example, Shenzhen, one of the world’s fastest growing megacities, recently released a consultation draft of its 2016-2020 action plan on building efficiency. The document provides an overview of the achievements and challenges from the last five years. According to the preliminary report, the city has accomplished all the major goals outlined in its last action plan, including energy savings of 4.8 million metric tons of coal equivalent (tce) over the five years, a 100 percent compliance rate of mandatory building energy codes for new buildings and a total of 8.3 million square meters (m2) retrofitted areas in existing buildings. While behind these numbers there is still room for improvement, these results are a significant achievement. Adapt and strengthen the current mandatory building energy codes, taking into consideration newer building materials and technologies. Improve the current CO2 cap-and-trade scheme to allow for transactions among public buildings that do not have well-defined property rights. Promote the model of Energy Performance Contract (EPC) in building retrofits and operations, a renovation model where a building owner can use the cost savings from reduced energy consumption to pay for upgrades in efficiency. 98.98 percent of the new buildings have complied with the building energy codes. The new action plan for the next five years includes an expanded focus on encouraging local governments to act on building efficiency. Qingdao, Jinan, Fuzhou, Xiamen and Xining are among the increasing number of Chinese cities that are joining the ranks of Shenzhen and Shanghai in developing their own action plans. More local governments should continue to join this movement. Too few other cities in developing countries have developed action plans to transform their buildings. Despite strong and growing commitments by 454 local governments to tackle climate change, fewer than 10 percent have actually developed a concrete action plan. Even among the growing number climate action plans at the national level (such as INDCs), too few address building efficiency directly. 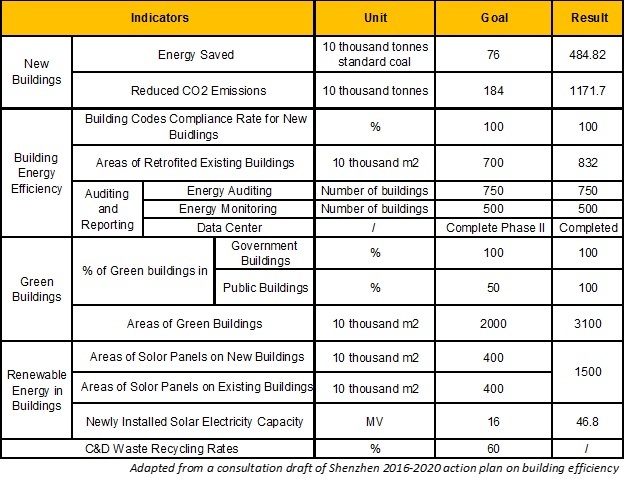 Although some elements of the Chinese planning system are unique, such as the opportunity of Five-Year Plans as a policy window, action plans can be a valuable tool for cities worldwide that are thinking strategically about improving building efficiency. While cities are unique and have diverse opportunities and priorities for improving building performance, clear roadmaps at the local level are essential in order create a global impact.